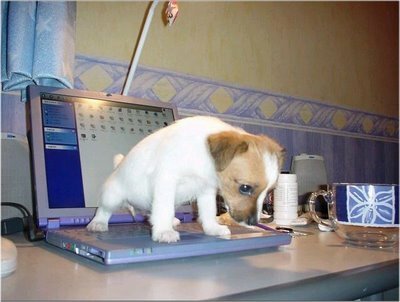 In case you cannot tell exactly what this puppy is doing to this computer, I'll give you a hint. He is very aptly describing how I feel about computers today. A funny thing happened on Friday. My wife had to get a substitute for the morning for her second grade class because she had to attend a workshop for a few hours. To be fair to this poor woman, Kendra says this is a pretty difficult class. She has an unusually high ratio of problem kids with enough individual issues to write a book explaining why working to teach wombats how to ice skate might be a bit more fun even if it were a lateral career move. Nevertheless, it kind of melts my heart to hear her speak so endearingly about them with such longing for their future and respect for them no matter how rotten the rest of the world might think they are. What some may see as a little monster she sees as a child; a child who possibly lives in horrible circumstances of abuse but is still sweet. A child who is already flashing gang signs in second grade to the immense pride of his family even though his basic nature is to be positive and kind. Back to the substitute: she unexpectedly chose to take the class to lunch over a half hour early and then she walked straight to her car and drove away! If Kendra has ever felt tempted to do the same, it has never shown. If she feels it is unfair to have so many of the problem kids put in the same class, she has never said so. She merely works hard to show Jesus to some kids who might otherwise struggle to find Him. I am proud of her even if the world devalues teachers and schools and their relative worth. It seemed pretty much like any other day, except for some reason I was not watching the morning shows like I usually do. I was getting ready for a quick trip to Tyler, Texas to pick someone up for a return trip that afternoon. On a good day I could get to Tyler in about four hours. Grabbing something to eat I switched on the TV and knew immediately from the looks on the faces of the anchors that something was very wrong. A plane had hit one of the towers of the World Trade Center- probably a horrible accident but there were no details available just yet. Then an image entered the scene of the existing burning tower. Another plane was headed for the second tower. Before it hit I knew we were under attack. It is amazing how many thoughts can go through your mind in an instant: What was starting before our eyes? What would be the impact of living in a military town? What would the world my kids would grow up in look like? 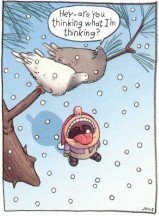 How would today turn out? I think I forgot to breathe for a while. My cereal was no longer the least bit appealing. I know that there are people that want to kill me. I know they want me dea simply because I do not believe as they believe. They also want to kill everyone else who does not believe as they believe. They want to create a new society wherein everyone believes as they do or they will be destroyed. I believe such people have existed before. I do not pretend to know exactly how Christ would deal with such people. I know he would love them. I try to, but it is hard. It is not always easy, but Bin Laden has been the most constant figure on on my prayer list outside my family. I pray that he will know the risen Christ. I know God can answer those prayers but I honestly have great doubts that He will. I also know that God does not respect Americans more than anyone else. And while my family is more important to me than I can express, I know that God does not love my kids any more than kids of the same age in the Middle East who are calling for their death. It is a very sobering way to look at it, but I still believe it. America does not have a birth right. Still, God has used people throughout history to work on His behalf and I think He has even used modern armies. The notion that we should sit idly by while genocide was being committed by the Nazis or while similar events have taken place in the Sudan is something I have a hard time believing. I must say that our current situation sounds similar. One group feels they have either a superior position or the only message of truth and anyone who disagrees must be exterminated. The only difference is the relative inability to recognize a head on the beast attacking us- a beast that wants to die almost as much as it wants to kill. I still wonder how this day will turn out. I stll wonder what kind of world our kids will live in. I still wonder what our role in all of this is. I wonder if anyone but God knows those answers. The questions have huge impact. If one side answers them incorrectly, it's a mistake. If another view turns out to be wrong, it's a tragedy. Neither option sounds great. So my prayer today is in one way the very same prayer it was five years ago. Ultimately, what I truly know is that one element of my prayers on that day five years ago is the same today and will remain the same: Lord, come quickly. I Call This One "Irony"